What led you to file the public interest litigation (pil)? On July 26, 2005, there was a deluge in Mumbai. It caught the administration unawares; all utility services broke down. I was one of those stranded, who spent the night under a flyover. I started wading back home at about 4 am. From horizon to horizon, I could see nothing but water. I reached the suburban railway station in Sion and found the platform submerged. What struck me was: the government has plans for an underground rail. I thought if a platform on the surface is under water, what would happen to the underground rail. That night I waded and swam before arriving at an overbridge. I could see the Mithi river in spate. Next I learnt the government had blamed the Mithi for the flood. I had a hunch something was wrong and began researching on the river. The results led me to file the petition. I estimated the discharge on July 26, 2005 was 35,000 cusecs. Now 40,000 cusecs is the capacity of the world’s largest canal—the Narmada Canal in Gujarat. I found there was nothing wrong with the river. It simply had no exit. The river is a channel through which a given amount of water flows. This river had been there for 60 million years. Nobody, including the government, knew it was one of the world’s oldest surviving river systems—a river system with tributaries and aquifers. But the river has been blocked at every corner, there are encroachments, constructions on the riverbed and at the place where the river discharges into the sea. In natural course, the discharge mouth of the river is much wider than the river upstream. But the width at its discharge point has, over the past four decades, gone down from 1,000 metres to 40 metres. So the river could not flow into the sea. Every open area in the city is paved. Where does the water flow? Will you elaborate on encroachments? A river flows through a given channel and on its banks are wetlands that take the overflow during the monsoon. In case, the river is discharging into the sea then twice in 24 hours tidal water flows in through the creeks and enters wetlands. So wetlands are reposes of overflow, they sustain the water level to an extent. The wetlands have mangroves, which absorb whatever water they need and the rest of the water percolates. For an island city, Mumbai’s water table was pretty healthy till three decades back. You construct a building and there was ample water. Now the water table is sinking. Mangroves have been chopped and alleys cut through them. By allowing construction, the government ignored Mumbai’s river system—in fact, it ignored that Mumbai is a city within a river system. rcc walls block the river’s outlets. What did your PIL plead? I filed the petition in 2007. Mangroves have been declared as forests by the apex court. But the Mumbai mangroves are still within the jurisdiction of the revenue department. Why has the government not transferred it to the forest department? The forest conservation and wildlife protection acts should apply to the mangroves—they have varieties of animals, migratory birds and reptiles. Few cities have marine and freshwater life. The pil pleaded there is a deliberate attempt to withhold the transfer of the mangroves to the forest department, so that the forests can be leased out to real estate. Did the petition draw from history? It did. The islands that constitute Mumbai have been there for millions of years. They were densely forested once. The city was developed in the colonial period. But the ecological footprint of colonial rule was far less than that of post-colonial regimes. They had taken care that forests were not destroyed. Forests on Malabar hill, Kambali hill and Sewri were intact when the British left. We have plundered them. The British took care that Mithi's water exits were not blocked. The railway bridges were once 600-700 metres wide and now they are just 40 metres. What has been the pil's progress? The court asked me the basis of my statement on the railway bridges. I showed them colonial records. The court then directed an inspection of the entire Mithi river area, including those under the railways. The deputy chief engineer of Western Railways was part of the inspection team and he argued the width of the railway bridge is what it was five decades back. I showed him records, which showed even in the 1960s the bridge was 600 metres wide. 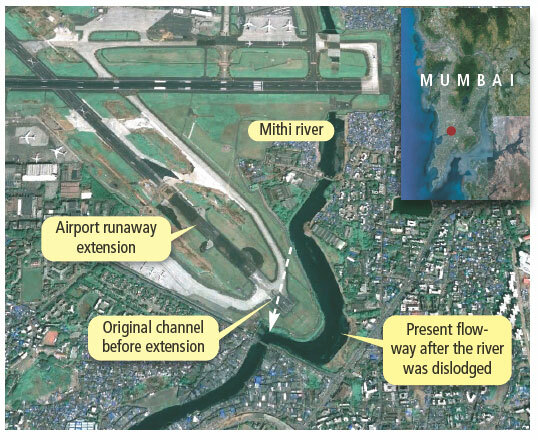 I took the investigation team to the area where the International Airport Authority of India has pushed the river out to extend the runway (see graphic). In court, I asked under what act was this extension allowed. Under the law, you cannot change the course of the river except for constructing a dam. Even then you have to restore the river to its main channel downstream. 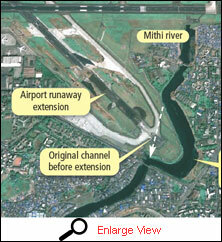 The airport authority has diverted the river at 90 degrees at four places within half a km of its stretch. I challenged them to show any river system in the world, which flows at 90 degrees. Rivers don’t flow at 90 degrees. They meander like the English letter S. The court has asked the Airport Authority to explain. It has so far - not given an answer. Has the PIL improved matters? Somewhat. Four choked discharges of the river have been restored. The matter came before the courts in May 2007. The monsoons were to hit in two months. Notices had to be sent to the Brihan-Mumbai Municipal Corporation, hydraulic engineers and the irrigation department. I told the honourable courts that monsoons do not respect any adjournment. The court gave five days to the state agencies to get things right. Now there is no flooding. The court has also constituted a committee of ecologists and experts to look into Mumbai Metropolitan Region Development (mmrd) authority’s beautification drive. What is this beautification? Entertainment centres, restaurants? When the court asked mmrd to explain its beautification drive it produced an engineer’s report which the court rubbished. It said we want eco-solutions. A committee of scientists and ecologists was formed to find ways to restore the Mithi. The pil’s ambit has been widened to every river, every forest, every catchment in Maharashtra so that we don’t have to go to the court every time a mangrove is chopped down. Every city in the world cries for a river within the city. Here we have Mithi River which we have turned into a sewer. Imagine this river with clean blue water and pleasure boats in it! Imagine the river bank developments and greenery on the sides right up to a clean Mahim creek. Nowhere in the articles I have read about Mithi river clean up, I have seen any sewage treatment system mentioned. Same goes for Kalyan river where untreated raw sewage is flowing in from the city. I hope there is a political will to clean up our city rivers before we lose them for ever. 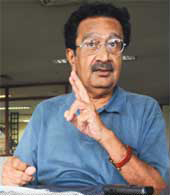 Dear Mr.Jagdish Gandhi, I really appreciate your research and article on the Mithi River. Just recently I visited the 90 degree point myself and took a look at the state of the river there as well as near the 2 bridges that connect Bandra East with Kurla. The river was really in a bad state. Can I have you email address so that I can write to you as I am very keen on the clean up of the Mithi River as well as History of Mumbai. Especially on areas like Bassien, Sion, Mahim, Bandra and forts in Mumbai. This is a blight on the face of India. Too bad we boast of so many IIT engineers , the brightest in the world and we do not have the political will power to clean up our rivers. Driving by this area makes you want to throw up. It shows the ugly side of India, where all the politicians use public money to fatten their pockets and the people live like gutter rats on the banks of the river and see nothing wrong with it, sorry i dont mean to sound so crude but the BMC has failed miserably. I wish the politicans had to live right there in Dharavi to see what an absolute abomination this is.